The Pre-process section is a musical program leveling function. Its primary purpose is to control program level over a wide range in order to provide optimum conditions for the following enhancement stage. When the enhancement is disabled in normal mode (at 0% with Safe mode deselected) the pre-process section can be used as a conventional leveling section in it ’s own right. The purpose of the enhancement process is to provide sample value limiting and overall program loudness improvement. The process follows the pre-process section in the signal path and is controlled by a separate fader from 0% (no action) to 125% (maximum action). In normal mode the range from 0% to 100% fades in the effect to full level, at which complete sample value limiting occurs. Settings from 100% to 125% further modify the process to progressively increase loudness and program density at the expense of increasing potential distortion artifacts. Safe mode is provided to allow absolute peak level control without excessive enhancer action, even when using slow attack settings. In Safe mode the enhance process is set to run permanently and the enhance slider modifies the action of the process (rather than the proportion of the effect). 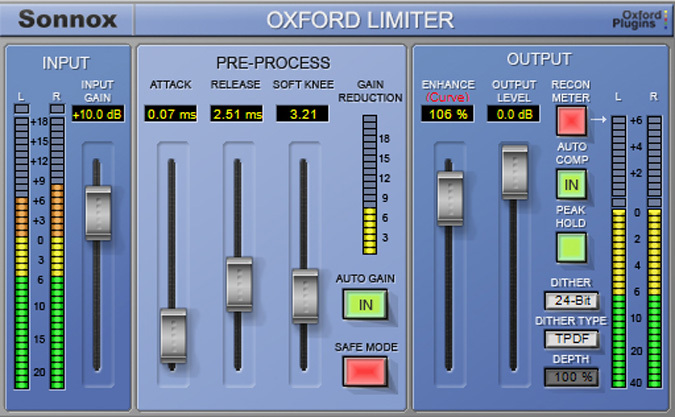 Setting ranges from 0% to 100% control the degree of program loudness boost generated by the enhancer. The control region from 100% to 125% works identically to normal mode. It should be noted that in safe mode signals at all levels are being processed permanently, therefore some minor changes to the program dynamics can occur even for a minimum setting of 0%. The enhance process improves the perceived loudness and presence of the program by modifying the dynamic and harmonic content of the signal. Since the method used is different from the pre-processing section, it can further enhance the perceived volume of a previously processed signal whilst suppressing all signal overloads. As the limiting action does not involve conventional sample value clipping, harsh distortions are avoided and program detail and dynamic information is largely retained. The attack control provides a means of increasing the attack time to achieve a favorable improvement in the sonic qualities of the peak reduction process by allowing peak program transient events to escape hard gain reduction. Since the plug-in has internal headroom these overshoot peaks are retained and not clipped. Sonnox offers custom bundle options, which means you choose which plug-ins you want to include in your bundle. If you need multiple licenses of 1 plug-in you still qualify for the discount. Just pick and mix the plug-ins you want to make up your own custom bundle, and the more plug-ins you choose, the greater the discount you will get. Simple. Use the Contact Us form and get your custom price quote now.